Shop online for 37 tap and die at discounts up to 26%. K & S is ranked #1 out of 7 tap and die manufacturers, followed by Du-bro, and Great Planes. This is a 0-80 Tap from K & S Engineering. This is a 2-56 Die from K&S Engineering. This is a 1-72 Tap from K & S Engineering. This is a Die Handle from K & S Engineering. This is a 1-72 Die from K & S Engineering. This is a 2mm Die from K&S Engineering. This is a Ten Piece Set of Standard Taps & Drills from Dubro. This is a 2-56 Tap & Drill Set from Dubro. This is a 2mm Tap from K&S Engineering. This is a 2.5mm Die from K&S Engineering. This is a Ten Piece Set of Metric Taps & Drills from Dubro. This is a 4-40 Die from K & S Engineering. This is a 3mm Die from K&S Engineering. This is a 3-48 Tap from K & S Engineering. This is a 3-48 Die from K & S Engineering. 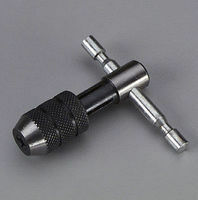 This is a 2mm Tap & Drill Set from Dubro. This is a 4mm Die from K&S Engineering.